Now I’m aware of the fact that you might not all be the diehard He-man fanatic’s that I’ve become (though it is only a matter of time! ), so I shall re-post the pictures of the characters along with the finished articles, so you can see what I was shooting for (and by how far I missed!). As usual I began by basing up the figures (after Cringer was cracked off of his plastic base and glued to a tuppence that is), this was done with some “Tetrion” all-purpose filler, though I wonder sometimes if they realise this is one of the purposes it is put too! I also added the odd cat-litter stone here and there before they all went out for a spray coat of matt black. Then the real work could begin, and I’ll cover that individually. 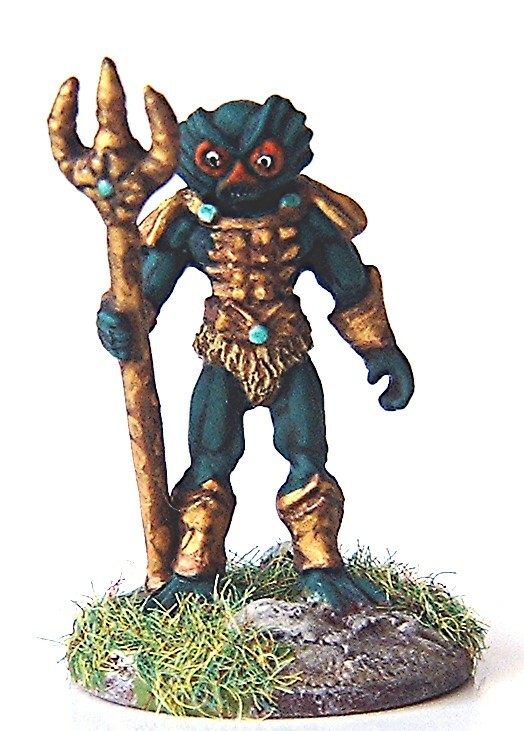 Mer’man, where to start with Mer-man, well first off the action figure and the cartoon versions vary greatly, both in appearance and skin colour, now as I stated earlier in this month’s build, my figures finished face is something of an amalgam of the two, but when it came to painting, I sided very much with the animated version. So after a base layer of German field grey was applied I mixed aquamarine with turquoise and a small amount of shamrock, till I was happy with the colour and used this to highlight all the flesh on show. 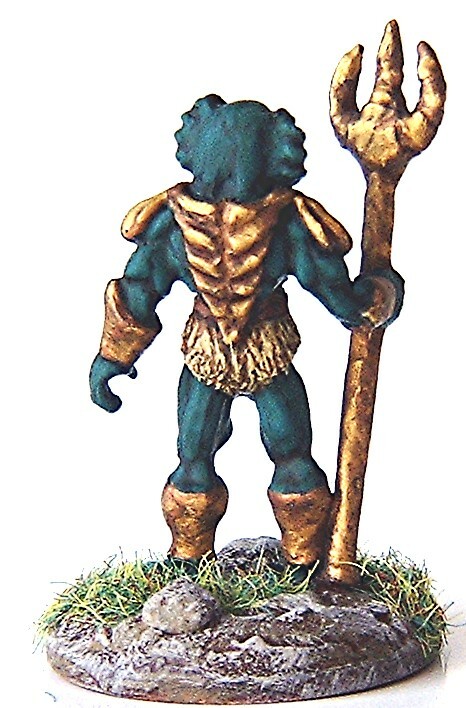 Then turning to his armour and trident, both toy and cartoon versions have these in yellow, but I decided that this was only because they couldn’t do it in gold (that’s my excuse and I’m sticking to it!). So a base of bronze was painted on, and this was then highlighted with shinning gold. The area around his eyes was then painted orange, and I ran a little dry-brush of the same down his “snout” too. His pants I undercoated with some dark sand, and dry-brushed with some light sand (see I kept these yellow at least!) and his belt I painted chocolate brown with leather highlights. Stratos’, as his costume (I’m guessing it’s a costume as the bit of his face that’s on show is flesh coloured) is predominantly grey, that’s where I began, by giving him a coat of Dark grey mixed with a little mid grey, I then highlighted this with a mix of mid grey and a touch of white, I added a little more white again for the hairs on his legs. Then turning to his helmet and feathers, I undercoated in dark red and then added bright red highlights, I also did the rockets on his back this way, the original figure was apparently produced with either, blue harness, and red feathers, or red harness and blue feathers, so I decided on a bit of a “mix’n’match” of these colours on mine. This meant that I then painted the harness (and cuff straps) in porcelain blue with a touch of royal blue added and highlighted in just porcelain blue, his face mask was added in these colours too at the same time. The tiny bit of his face that is visible was then painted European flesh, and his beard was coffee, with cream highlights. To add a bit of interest to his belt I painted the buckle in chainmail, and added a dot of metallic red to the centre. 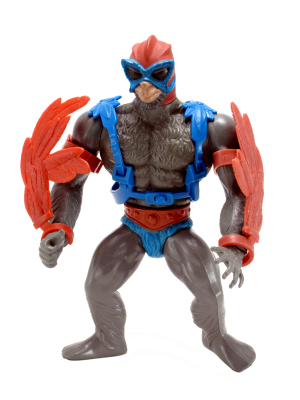 Now his “undies” are supposed to be blue, but I decided to go “off canon” as far as these are concerned, originally I was going to do them in the same “blue-grey” I used for Beast-mans, but decided that it was too similar to the rest of his costume, so instead, sticking with the “blue/red” theme I undercoated them in chocolate brown before dry-brushing them in chestnut. I think it works. A dot of dark grey as a highlight for his eyes and that was number two done. 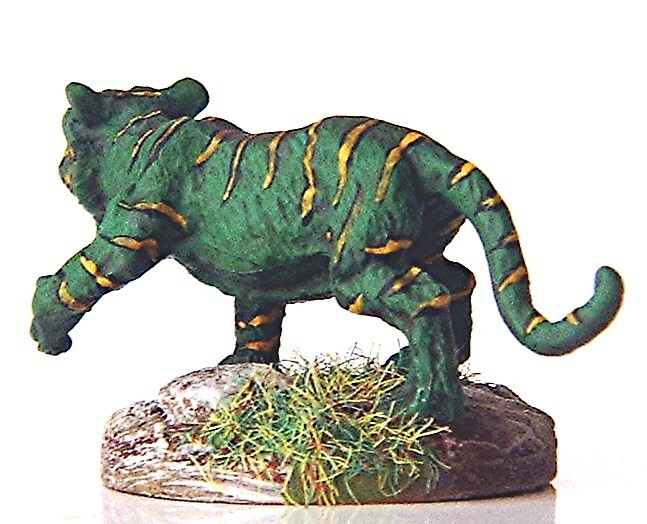 Cringer, though by far the easiest conversion (basically nothing but a re-paint), was on the other hand the figure with the most “free-hand awkward bits”, but before I got to those I began by getting his base colours on, so I began by giving him an all over coat of deep bronze green, then followed this with a heavy (really rather heavy in fact), dry-brushing with a mixture of more deep bronze green, olive and shamrock, these were mixed together in varying amounts till it looked about right. Next I began adding his stripes, in black (I also added his nose at this point). And once these were dry I added the yellow inner lines on his stripes with citrus orange (this was a right pain I’ll tell you! ), I added his eyes in lemon yellow next along with his mouth in dark red with pink burgundy mixed with Polish crimson for his tongue. I painted his teeth in white as I wanted then to stand out against his grey muzzle, and that came next, this was a mix of light grey and white gently dry-brushed on, then to finish him off I dotted his eyes in black, along with his claws and the inner parts of his ears, lastly I added a highlight to his nose in dark grey. All three were then given a coat of “Quickshade” strong tone and once dry had their bases painted and flocked in my usual fashion. As always, a final spray coat of matt varnish finished them off. Well that’s it, the end of another “Forgotten heroes” month, as usual it’s been great fun, though even more hectic that usual, I really thought I wasn’t going to get finished in time this year!! The best bit of these months is of course seeing all the wonderful figures the rest of the entrants produce, and this year has been no exception with some outstanding work on show, if you haven’t already been to the “Forgotten Heroes” site, please go and see the results of their labours, it well worth a visit! 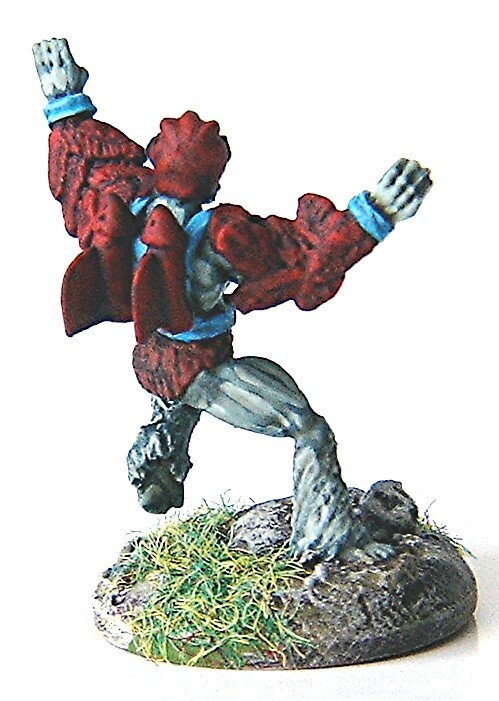 This entry was posted in 28mm fantasy, fantasy, Foprgotten Heroes, Masters of the Universe and tagged 28mm fantasy, fantasy, Forgotten heroes, Masters of the Universe. Bookmark the permalink. All three turned out really well Roger, your colour choices on the two warriors, looks great, and the freehand stripes on Cringer are excellent. Those look awesome Roger. Stratos in particular is really well done. 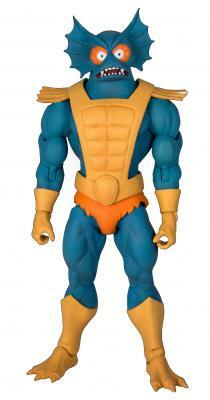 I love the color palette and the sculpting on Mer-Man’s Face and Stratos’s feathers. I find good stripes are never easy to paint for me, whether on horses, giant cats, or even on cloth suits. 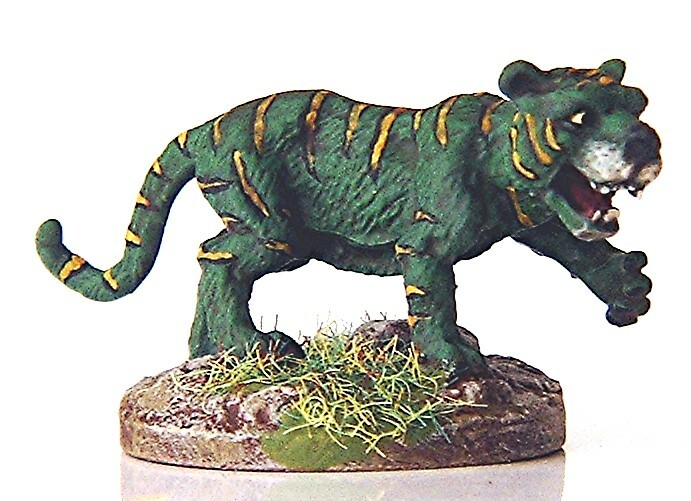 I agree with Dave: Cringer looks terrific. 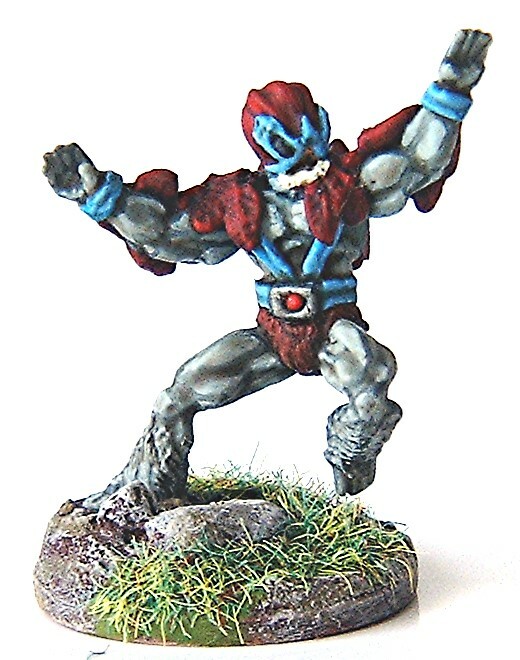 I know Grenadier put out some MOTU miniatures a long time ago, and they fetch a pretty penny nowadays. Do you have any of them? Thanks Keith, stripes are a pain to do I have to admit, though I quite like the challenge they present (I’m not saying I can do them very well though). Fantastic stuff! My little brother had the Stratos action figure, and lookimg at your sculpt, I thought I was looking a picture of the original toy! Well done Roger! Mad skillz I say. Mad. Thanks Harry, glad you like them. Please tell your brother he was a lucky chap, I only had Zodac!! (neither good or bad, and no use to either side!). He had tons. Then a destructive nephew made short work of all of them. Terrible loss. Durant take away from the incredible job you did! Ahh, children, toys are wasted on them, if I could go back as see my seven year old self…I’d slap me round the ear and take all my toys off of me and put them safe in the loft! I’d thank me in the future. Hey, you made it… but only just! Still many congratulations on three outstanding minis. Even though I was never a fan of Masters of the Universe, I can appreciate all the hard work you put into converting and painting this trio. Take a bow and then a well earned rest! I could do with a rest, but as you know us wicked people don’t get any! These are amazing! Merman especially! Nice work. Very nicely done, Roger. Soon there will be only the really obscure characters left (Mekaneck anyone?). You want obscure, check out, Mosquitor…. Yep some things are definitely “forgotten” for a reason! Thanks Andy, though I take exception to calling Mer-man a side character! 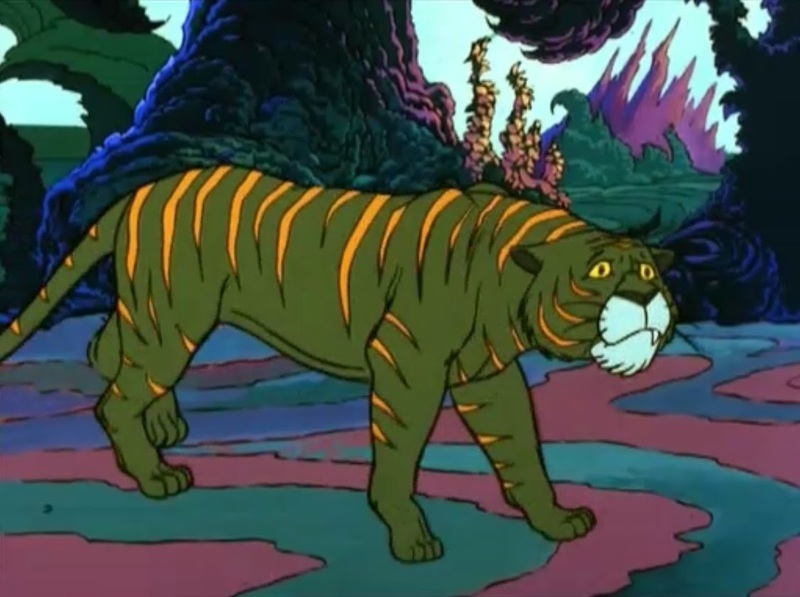 He appeared in a good number of the cartoons and cringer in nearly all of them! God I am getting sad in my old age!! Absolutely superb! Another amazing year Roger, well done Sir. Thanks Michael, it was a push this year, but I think they came out OK in the end. I’ve run out of dollies now though so don’t quite know how I’m going to do the next ones.